As a chicagoan, anthropologist, and foodie, I have mad respect for Rick Bayless. With his educational background in Anthropology, Rick Bayless really gets the importance of connecting ingredients with culture, incorporating new ideas, and making home-style Mexican cooking accessible. I got this recipe from Rick Bayless’s “Mexican Everyday”. This recipe for Pollo Pulquero stood out to me for a few reasons: Slow cooked meat is one of my favorite ways to have meat, the flavors sounded simple and delicious, and it was a recipe that I could easily make around my schedule. This is a great recipe to make before you leave for work, or prep the night before. And let me tell you, the aromatics from this will make your home smell amazing. Of course I had to add my own personality to the recipe, and decided to add some lime to the slow-cooker to bring a citrus flavor. 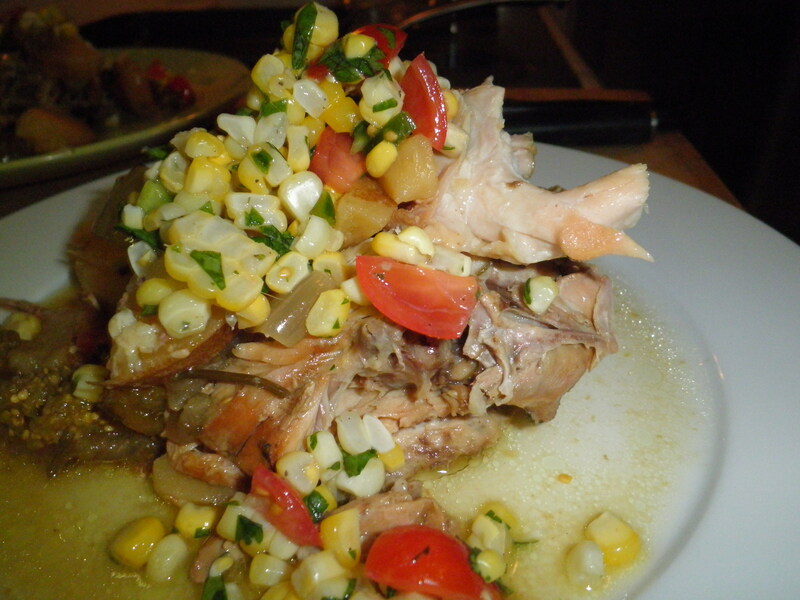 I also decided to serve this with some corn salsa, as it adds a nice sweetness and texture to the meal. I promise if you give this a try, you will not be disappointed! This slow-cooker recipe is all about layering. I started with the potatoes on the bottom, then chicken (skin down), cilantro, onions, and tomatillos. 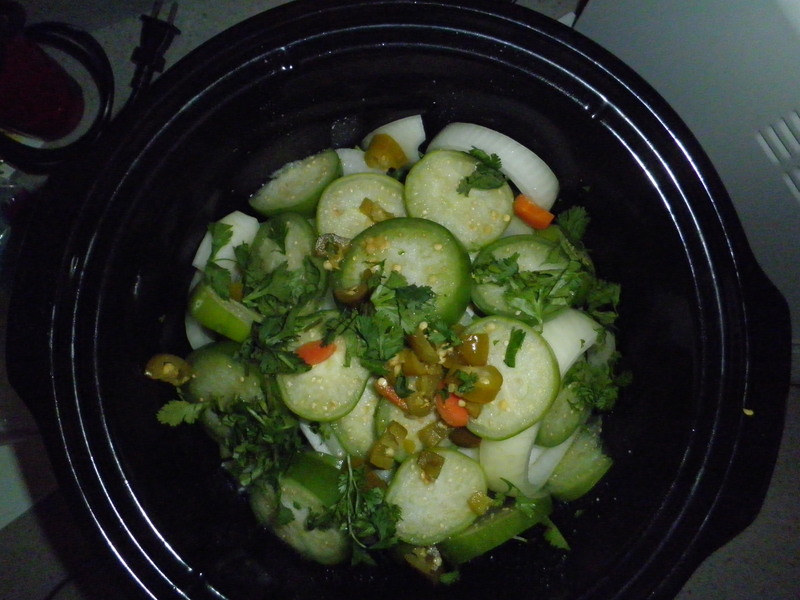 Once layered, I poured the pickling juice on top, squeezed lime juice and added the diced jalapenos on top. Be sure to salt between each layer, as this is the only salt in the dish. 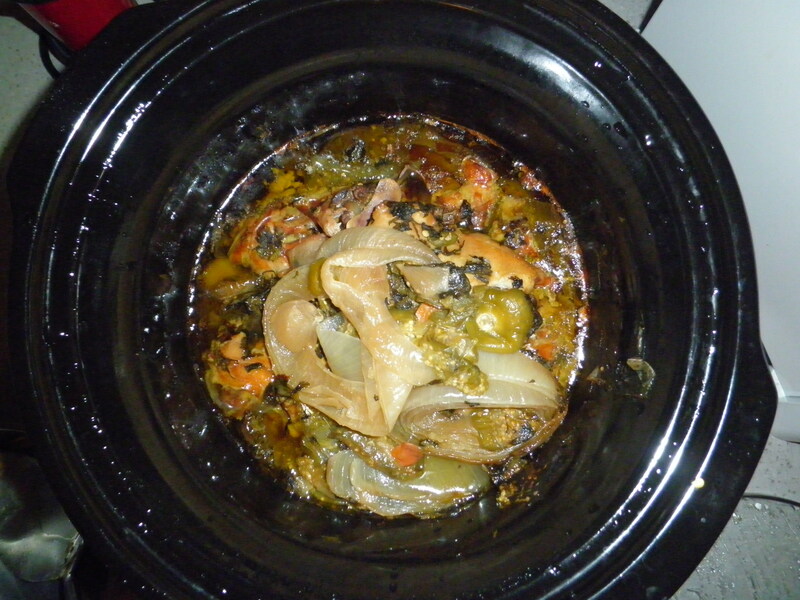 I set my slow-cooker on low for 8 hours, but Bayless calls for 6 hours on high. Once cooked, I spooned out the extra juice and decided to put it in a small pot and simmer it down a little. The juice is mostly the fat from the chicken skin, but adds some more flavor. Utilizing this juice is purely optional. *Bayless’s recipe calls for skinless thighs but my store only had skinned and I thought it would add some great flavor. You can also use pork shoulder or beef chuck, but Bayless suggests staying away from leaner cuts as they’ll dry out. Boil corn ears until tender but not too soft. While corn is boiling, chop jalapeno, tomatoes, and cilantro and place in bowl. Once corn is cooked and cooled, cut corn off of the ear and add to bowl. Add lime juice and salt. Toss mixture. Plate a chicken thigh and scoop of potato, onion, tomatillo. Add sauce reduction (optional). Top with fresh corn salsa. The great thing about this recipe is that it’s flexible. If you only have sweet potatoes and chicken legs, you can still give this a try and it’d come out great! There is no easy way to fail at this. If you’re looking for more easy, delicious, flexible Mexican recipes, I encourage you to get some of Rick Bayless’s books and start testing things out.